The Art History Business Capstone class presented an exhibition based on the Japanese “Monster Scroll” located in special collections focusing on the Nurikabe, Akakuchi, Yumeno seirei, and Yako. This exhibition was highlighted with interpretive artwork created by local artists. PROVO, Utah (December 1st, 2018)—Sunlight’s fingers are creeping away, soon the forest will be encased in a dark envelope. The wind picks up and the trees start moaning and shifting. Your steps become quicker, beating a tune on the forest path. You suddenly run into something…but nothing’s there. You run your hands up and down and meet an invisible resistance. Something has blocked your path. The only answer: the Nurikabe. The Nurikabe is a Yokai creature in Japanese folklore that will appear mysteriously on roads and block travelers at night. The only way around is said to be if one taps the nearby ground with a stick. Just like the Nurikabe, the Yokai featured on “the monster” scroll are depictions of creatures that have been used to understand natural phenomenon and the fears people had. The idea is that if fear is in physical form, it’s easier to confront. Student in the Art History Business Capstone class sent out pictures of some yokai to local artists to create their own rendition of these creatures or fears. Hayley Page, an artist and curator in this exhibit created a blanket that represented how she deals with some of her own anxiety. All of the artwork and creations that were used represent real things that people struggle with. The curators of this exhibit also created a board where the community could write down their own modern-day fears. Meagan Anderson, one of the curators commented, “The way we’re presenting it is, what our modern-day monsters are; and I think it helped us to highlight a lot of issues that are happening at BYU.” A lot of issues that were put on this board were about fears of mental health issues taking over, concern with politics, or even relationships. 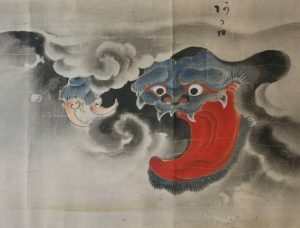 The purpose of connecting an old Japanese scroll depicting of monsters provides insight to our own modern day fears and monsters. By understanding that it’s not just an art form we don’t see as much, but that it represents real fears, helps to create understanding and commonality between cultures. The more we understand, the less we judge.